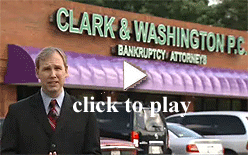 Clark & Washington was founded on the belief that no one should have to go through bankruptcy in Orlando alone. We believe that every person should have access to the advice and assistance of an Orlando bankruptcy lawyer at the time when they need it most. In order to make our services available to more people, we maintain five offices conveniently located in Orlando and central Florida. No matter which of our offices you visit, you can expect to be treated with respect and courtesy. Our knowledgeable Orlando bankruptcy attorneys and friendly, helpful staff members will answer all of your questions and help you make the best decision for your financial situation, whether that is Chapter 7 bankruptcy, Chapter 13 bankruptcy, or a different path altogether. Call one of our five convenient locations today to schedule your free consultation with an Orlando bankruptcy lawyer.